You know I am obsessed. Explore childhood turn-of-the-century style on our walking tour geared to children ages 5-12 and their families/caretakers. 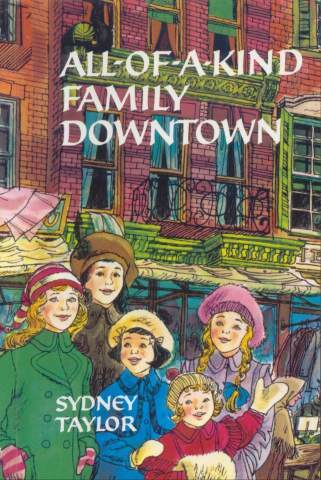 Follow in the footsteps of Ella, Henny, Sarah, Charlotte, and Gertie, the beloved sisters depicted in Sydney Taylor’s children’s classic All-of-a-Kind Family. Take to the streets on this neighborhood walking tour and discover where these immigrant girls lived, shopped, prayed, played and went to school. Admission is $15 per family. Part of the Preservation Detectives series at the Museum at Eldridge Street. For more information, email sverity@eldridgestreet.org or call 212.219.0302 x5. Frume Sarah’s sister here. Thanks so much for the heads up. Wanted to let you know that your link to the museum should link to http://www.eldridgestreet.org/. Right now it is going to some strange unrelated sight. Oh I am too excited! I grew up down there but haven’t traced the exact locations in the books. Oh my!!! !